How do you help a Paint Leader reach its Professional and Homeowner /DIY audience? Wherever you may travel, from country to country, this popular brand of Decorative Coatings has almost certainly been there before you, which clearly depicts its vast heritage and network. 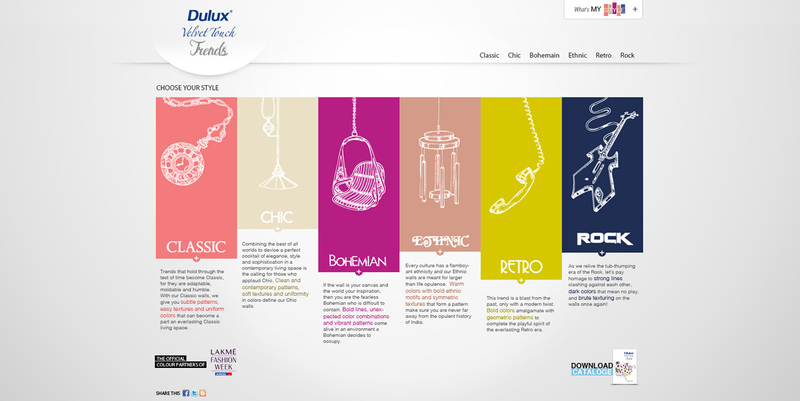 Present in India for over 100 years, the brand, Dulux by AkzoNobel is one of the best known paint brands worldwide. 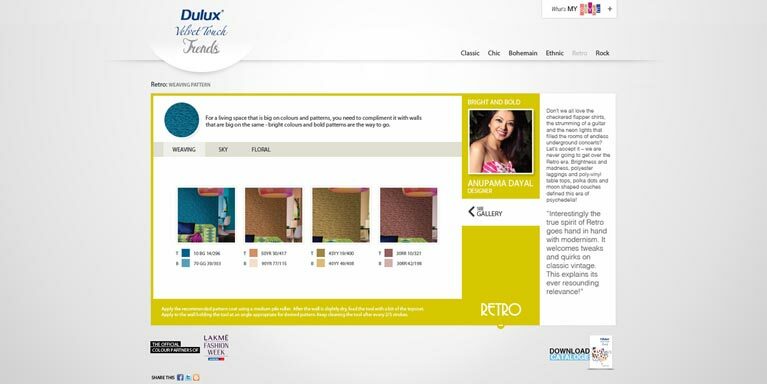 With a vision to help people create a beautiful place to live, work and find an association with different hues, Dulux connected with Olive to develop a distinct online presence. A unique web existence that will be able to cater to both the consumer segments, vis-à-vis, the professionals (B2B Market) and end-consumers (B2C market). In other words, to give both the DIY user and professional painter help and inspiration to create the best possible results. Also, offer both these types of customers, utility-based engagement, online. After an in-depth research and analysis, the insights gathered led to the creation of Dulux Professional (The official B2B website for Dulux in India), an application based experience for the customers. We understood that colors gave personality and separated a house from a home. The tone, the texture and thought that it invoked, all worked towards unifying the image of its eco-system. It was this core insight that made us design a digital platform, that not only, an informed professional can use, but also be of help to an individual who wishes to paint his or her own home. For the professionals, this exclusive design was of major assistance, especially when it came down to consulting with staff and stakeholders. 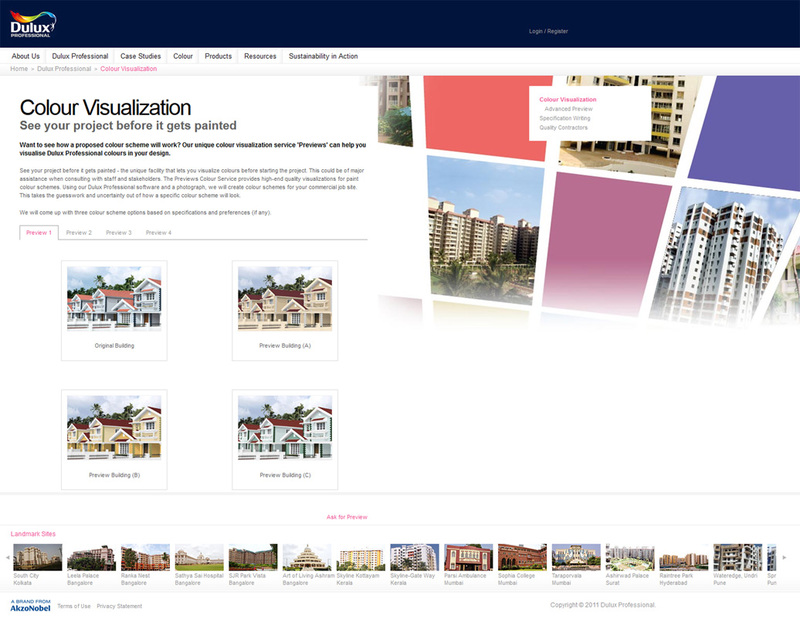 The feature which lets you visualize your job site/ commercial project in different paint colour schemes took the guess work out, offered an interactive experience, helping the experts to come to a decision easily. We understood that decorating a home is about self- pride because those surroundings reflect who we are, where we come from or what we think of ourselves. And if you paint it right, your home improvement project is definitely on the right track. Secondly, everyone wants to be complimented on their interiors. 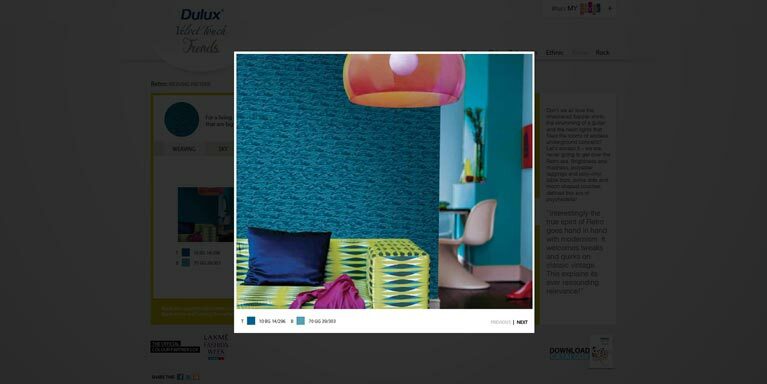 Keeping these insights in our messaging, we designed an interactive online persona of Dulux Velvet Touch- Trends (an ultra stylish finish from the Velvet Touch family) that offered a lively, useful experience to the customers. 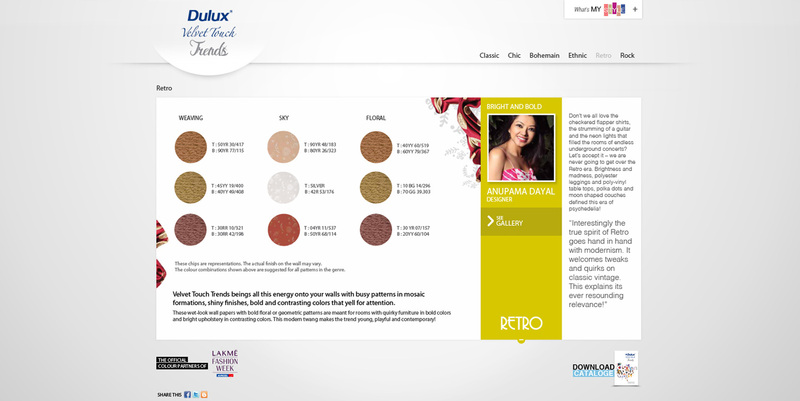 This unique digital décor website includes a range of patterns and colours under six different fashion themes, ‘Classic’, ‘Chic’, ‘Bohemian’, ‘Ethnic’, ‘Retro’ & ‘Rock’ (each endorsed by an Indian fashion designer), so that the customer can choose the one that best reflects his/her style and personality. This online initiative gained momentum as it inspired and assisted the audience in selecting the latest international style closest to their own, individual personality. A perfect balance that allowed them to put their own stamp of style statement through their very fashionable walls. We also came up with the idea that in this age of ‘Emoticons’, ‘Colours’ similarly, can be used as a medium to express not just one word but many different moods and thoughts at the same time. This led to the creation of the ‘Splash’ Application, targeted mainly at the B2C segment wherein you get to ‘Say it With a Splash’. The idea was tro create something as simple and exciting as a slot machine. Three rows; one with a colour, the second with an emotion and the third with a pre-written message associated with the chosen emotion. 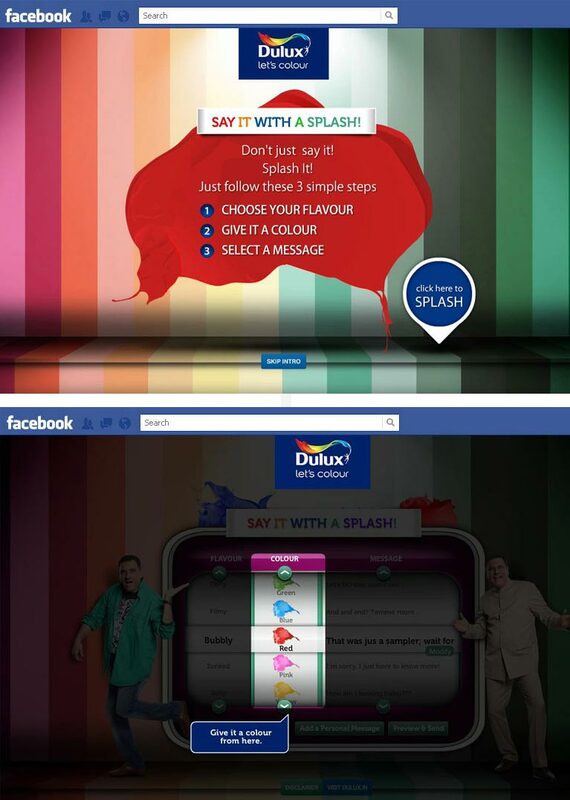 Make a combination, write your own message and hit the splash button to splash a friend’s Facebook wall. With a dedicated micro site in place, you also got the opportunity to talk to your friends, literally, by splashing a colour of your choice along with a customized message. The colours of success soared high as there was great excitement amongst the audience who actively splashed colours on their friends. Another unique aspect of this project was to have a singular brand voice. In order to maintain this communication effectively, we leveraged the offline initiatives on the digital front. The offline campaign, ‘Apne Rang Chalakhane Do’ was launched around the festival, Holi featuring leading film actors, Boman Irani and Shahid Kapoor. The idea was to simply bring alive the relevance of colors in people’s life through the festival of colors. 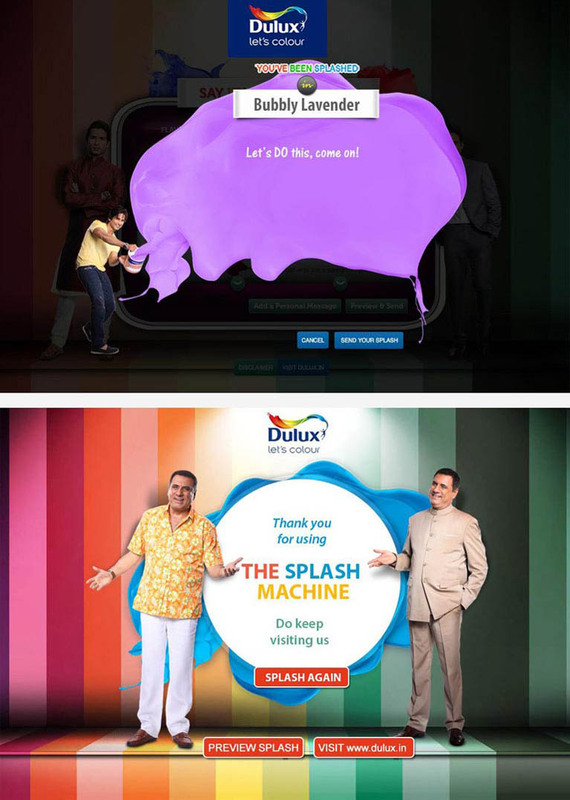 With this messaging, we developed the concept of the ‘Splash Machine’, which not only led to a massive amplification, but extended the online reach phenomenally. Not only because it was fun and interactive, but due to its fresh appeal, we were able to penetrate and create a mindshare amongst the customers. This initiative garnered a quick mass appeal as it was able to create the true impact, colors have in our life, and how we use them to associate and express in our day-to-day life! All that we hoped to achieve through this project was to create an online image of a global conglomerate with an Indian context and a design structure that would always stay relevant. The signature of each brand of having etched itself within the website, we wished to create a flawless and elegant platform that would work as a very efficient corporate website and also truly harness the spirit of the company and its heritage.